Getting your post bariatric surgery pouch ready to take on the day is not easy for some. So begin with a few sips of warm liquid such as decaf coffee, herbal tea, or warm water to allow the pouch to relax and get ready to start taking in breakfast. Fruit is about 80 percent water, so it’s easy to eat. In addition, it’s loaded with vitamins and minerals. Fruit doesn’t provide protein, though, which is where yogurt comes in. Yogurt is a good choice for breakfast because it’s fast and easy to punch up with added flavors. Even most people with lactose intolerance can eat yogurt without discomfort. Be sure to look at the labels and buy nonfat yogurt or light yogurt. Light yogurt is usually fat free and has less sugar because artificial sweetener is added. Of course, nonfat yogurt is also fat free, but it has added sugar. The nutrition facts tell you how many grams of sugar are in a serving. Lactose, or milk sugar, is naturally occurring and doesn’t cause problems with dumping syndrome; the added sugars are the ones that create problems. To see if the yogurt has added sugar, check if sugar or fructose appears in the list of ingredients. Per Serving: Calories 90 (From Fat 0); Fat 0g (Saturated 0g); Cholesterol 0mg; Sodium 70mg; Carbohydrate 16g (Dietary Fiber 3g); Protein 5g; Sugar 10g. You can substitute the light yogurt with plain nonfat yogurt or nonfat Greek yogurt. You can mix this up the night before and stick it in the refrigerator for a grab-and-go breakfast. In a small bowl mix the berries, sugar substitute, and vanilla. Place half the yogurt in the bottom of an 8-ounce glass. Add half the berry mixture over the yogurt. Layer the remaining yogurt and berries. Per Serving: Calories 110 (From Fat 0); Fat 0g (Saturated 0g); Cholesterol 0mg; Sodium 65mg; Carbohydrate 22g (Dietary Fiber 3g); Protein 4g; Sugar 14g. Substitute the light yogurt with plain nonfat yogurt or nonfat Greek yogurt. Although this recipe may seem high in sugar, the sugar naturally occurs from the fruit and yogurt, not from added sugars. 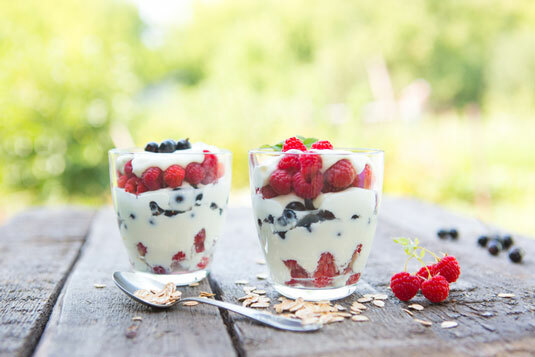 Berries and natural sugars are usually well tolerated after surgery, so you can enjoy this appealing recipe with strawberries, blueberries, and raspberries layered with creamy yogurt. If you make the berry mixture a day in advance, it becomes more syrupy.